Traveling by plane with kids is stressful - there's no way around it. You're all trapped in a little metal tube for hours on end with hundreds of strangers and no way to escape. There are a few major differences between traveling by air and traveling by car with kids and by far, the most important one is that traveling by car your kids can only drive YOU crazy - as opposed to the entire plane full of passengers. The best way to ensure that your family has a successful flight is to realize that your number one job is to entertain the kids, which means you probably won't have time to read much of that novel or magazine or trade journal, or catch up on movies. With that in mind you must know that most of these suggestions will involve you to one degree or another. 1. 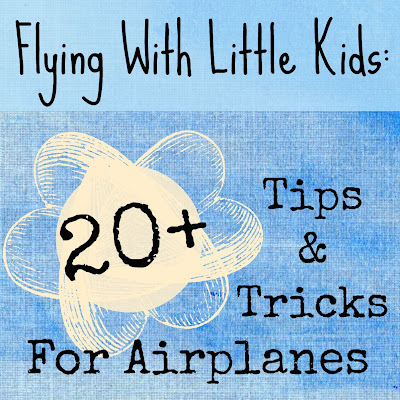 Airplane travel is a time to make a few key adjustments to your family rules re: behavior. When we fly, we get more strict about our children adhering to our rules for public behavior (things that affect others) i.e. use your indoor voice, no throwing things, no roughhousing, try to keep the nose-picking to a minimum. . . you get the idea. On the other hand, we relax some of our other rules for this special time, so there are no limits on media use, they are allowed to eat more 'junk food' or treats, we're more tolerant of special requests, and we are much more likely to give in to whiny requests than we otherwise would be. No one wins by trying to make a point to a three-year-old 5 hours into a 10-hour flight. Once we were stuck waiting out a lengthy delay in the departure lounge at the beginning of an overseas flight. We bought our little ones a treat of some ice-cream bonbons, and at the end of the box our son started to get into a first class freak-out that he hadn't gotten his fair share. Normally he would've been out of luck, but in that special case we just went and bought another box. 2. Research your destination and layover airports ahead of time - our local airport (SeaTac - SEA in Seattle) has an indoor playground where the kids can safely run around and blow off steam, with large family bathrooms located right beside it. Chicago O'Hare (ORD), San Francisco (SFO), Boston (BOS), Dallas-Fort Worth (DFW) and Portland (PDX) all have great playgrounds as well - some more than one. Other airports offer special tours for kids, airport based exhibits from the area's museums and areas with kid friendly food vendors. It pays to take a few minutes before your trip to see what the airports you're traveling through have to offer, and make a note of where the attractions are, because they're sometimes tucked away in a spot you might not pass otherwise. 3. Read books and talk about air travel with your kids ahead of time - my kids really like 'Going on a Plane' and 'A Day at the Airport'. 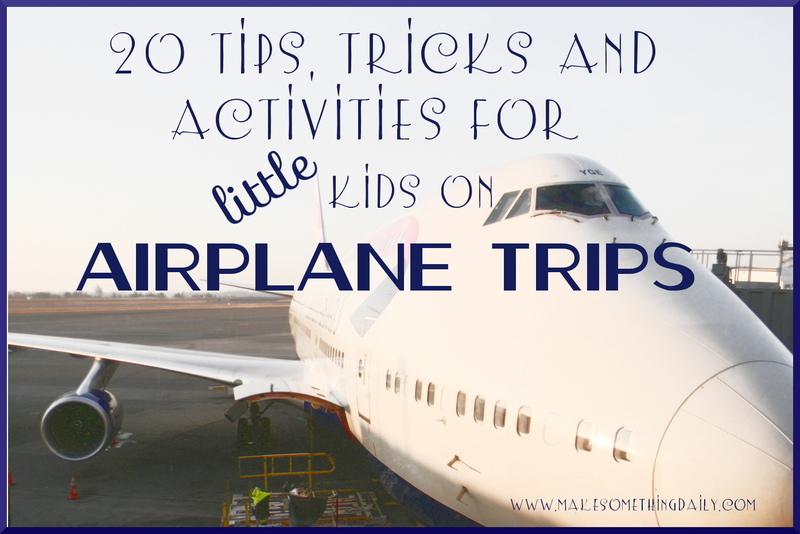 These are especially useful to get your kids used to some of the more unusual parts of plane travel, especially the security screening and flight attendant interaction. Talk with them about what the airport and the flight will be like, including how long it will be and what will happen - will you eat dinner, then sleep and wake up and eat breakfast? Maybe just eat lunch and then have a nap? Gently reinforce your expectations in the days or weeks before the trip so that they're not surprised during the actual flight. 4. Bring spare clothes; more than you normally would for a day trip. Pro-tip - pack each change in its own gallon ziplock bag (you can squish the extra air out to conserve space). If you need the spare on the trip, its likely you'll be glad to have the empty bag to contain the dirty clothes. This includes for yourself - we always bring at a minimum an extra shirt for each adult too since there's a good chance if your child gets grossly dirty you might be too. 5. Think about strategies to alleviate ear pain on takeoff and landing. The most important thing is to keep your child swallowing periodically to equalize the pressure in their ears. Juice boxes, milk boxes, gum, or lollypops can all help. We haven't had any problems going through airport security taking two small juice boxes per kid per flight inside the US; I just bag them in a ziplock bag and send them through the x-ray scanner along with the toiletries. Consider packing enough for the return flight in your checked luggage (especially if you are traveling to an unfamiliar area that might not have the brands/flavors your child usually has - we drink/eat whatever is available at our destination during our trip, but again, the flight is not really the time to have a standoff about how the local beverages taste). If you don't want to deal with beverages you can offer a lollypop at takeoff and landing - that can be effective especially if its a kind of special treat for your child. 6. Bring lots of snacks and make sure there are more than just sugary treats. These days it's rare to get free food on a flight, and snacks serve a couple of purposes: 1) they stave off the hungry crankies, 2) they're a good distraction, and 3) they can serve as a bribe if necessary. When we travel we bring snacks that our kids don't usually get at home - our kids especially love to get their hands on handisnacks (with the crackers and "cheese" and a little stick for spreading) which they never get any other time. Other good snack options are granola bars, cheese sticks, crackers or chips and fruit. 7. Introduce your family to the Travel Fairy. The Travel Fairy stops by on every trip our family takes, to make sure the kids aren't bored and are well behaved. She gives them little gifts and treats, and most importantly, everything she gives is wrapped up in wrapping paper. We wrap up everything the kids will have on the flight, even things they already have (like books for their Tag reader pens, or crayons), even sometimes their snacks. We try to dole out Travel Fairy gifts infrequently, and make sure that we've saved some for the return flight. 8. Drawing utensils for writing or coloring. This could be an aqua- or magna-doodle for a toddler, or crayons or markers for an older child. Square or triangular crayons are useful for littler kids so that they don't roll off the tray so easily, and markers whose lids snap on the end easily are good for older kids, for the same reason. 9. Electronic learning activity toys make for good distractions. We are a Leapfrog family, but V-Tech also makes nice toys with learning activities. Its a good idea to bring along a set of headphones (I like these noise-limiting headphones for small kids) to avoid disturbing those around you, although I've found that using toys or electronics with the volume low works since the ambient plane/engine noise is so loud. 10. Bring along a few new thin paperback books to read to your children. Most kids love story-time, and new books will hold their attention longer than ones they've read a lot. Of course, if there are a few books that your child could read over and over every day, by all means bring those! 11. Felt boards for storytelling and imaginative play. These are lightweight and can be either purchased or easily made. I put cardboard backing on the boards I made, but you could go without and have an even lighter and smaller activity. 12. Pipe cleaners or Wiki Sticks make for crafty, quiet entertainment. For very young children you'll need to be the one crafting them into shapes that can then be used for imaginative play - older kids can work more independently but might still need some help to see how sticks can be joined together. Our kids have made (or played with) horses, dogs and other animals, flower bouquets, crowns, jewelery and shapes. 13. There are tons of blog posts around that give ideas for toddler busy boxes/bags - peruse them to choose ideas that might entertain your little ones while still being quiet, light and easy to pack. I especially liked this one, this one, and this one. 14. Sticker books with reusable stickers are lightweight and easy to pack - you could get one that relates to your destination or one more travel-centric (what you can see at the airport). 15. Sticking with the same sticker theme (see what I did there?) - dollar stores and the $1 area of Target often have sticker packs with either seasonal themes or others like construction vehicles or farm animals that your kids can use to make their own scenes. I like to prompt my younger child by drawing a simple scene on a piece of paper than he can then add stickers to, like drawing a town layout with a few roads where he can add car and truck stickers. 16. iPad, iPod, iPhone or the like can be a lifesaver - load it up with games and videos. We use two iPod Touches which belong to my husband and me but for the duration of travel are claimed by our kids. For our last trip we also brought these external batteries, which helped for a long flight. I made sure that each iPod had different games and videos so that the kids could trade and have more things to do and watch. 17. Printable activities of your child's favorite TV shows/characters. Nickelodeon, PBS, Sprout and Disney all have websites where you can download and print activity pages. I usually put them into a report folder to keep them contained and organized. I like to do this instead of bringing one coloring book per kid because they can have more of a variety that way. 18. Travel journals with fun activities about your trip. I make travel journals for my kids before long trips using cheap blank notebooks and embellishing them with route maps, travel games and printed out puzzles and mazes. Then the kids use them throughout the trip as their notepad / coloring paper and afterwards to add in stickers and postcards and other little paper souvenirs from the trip. 19. Quiet card games to play - a regular deck of cards works for older kids, and younger kids would love to play with a Go Fish or Old Maid deck, or a small set of memory match cards. You can even make your own version of Memory if you like - either printing a set off the internet or drawing your own pictures. You can also make variations on Memory than can be great learning tools, like sight word matching or matching numbers with a picture of that many objects. 20. Word games and finger plays. It helps to have an arsenal of word games and other little activities ready that don't need anything but yourselves to play. Some of our favorites are "I Spy" ("I spy with my little eye something brown" and then people take turns guessing what it is), the "Story Game" (where each member of the family adds onto a story sentence by sentence and the last player has to add their ending and then recite the whole story) and the "Alphabet Game" (where each member of the family thinks of a word that starts with each letter of the alphabet). Another game that works well at the airport during layovers or before or after your flight is a variation of I Spy where you ask each child to spot a different thing that is not immediately visible but that might be seen readily (Can you find a blue suitcase? Can you spot a pet in a carrier? Can you see a mom with a baby?). 21. Route maps. I like to draw simple route maps that help my children visualize where we're going and how long it will take us. For airplane travel I divide the trip up into time segments and let them color in the segments as we go along for a visual indicator of "when will we get there?". 22. Coins can be fun. Your spare change can be used as entertainment as well. Let your children sort the coins into groups by size and/or color (of course watch toddlers carefully since coins are a choking hazard! ), or use them to make rubbings by putting them under a piece of paper and rubbing crayon or pencil lightly over the top. Older kids can practice making change in a variety of different ways or practice sleight-of-hand tricks, making a quarter appear or disappear.